Secretary of Education–nominee Betsy DeVos has fought to “advance God's Kingdom” by privatizing the public-school system. Betsy DeVos, whose nomination for secretary of education will be reviewed by the Senate Health, Education, Labor, and Pensions Committee on Tuesday, has never taught in a classroom. She’s never worked in a school administration, nor in a state education system, nor has she studied pedagogy. She’s never been to public school, and neither have her children. She has no record on higher education, except as an investor in the student-loan industry, which the Department of Education oversees. As Massachusetts Senator (and HELP Committee member) Elizabeth Warren wrote recently, there is “no precedent” for an education secretary with DeVos’s lack of experience in public education. Publicly, DeVos talks less about serving God than about improving quality and equity in education. But there’s little evidence that the reforms she’s fought for have improved Michigan’s schools. In 1993, DeVos helped to advance a bill that opened up Michigan to the charter-school industry. Since then she’s advocated—successfully—to eliminate a cap on the number of charters operating in the state, and to block measures to improve oversight. As a result Michigan now funnels $1 billion in taxpayer dollars to the privately operated schools, which mostly have failed to outperform traditional public schools. In spite of the rapid expansion of charter networks, many children in the poorest neighborhoods of Detroit still live in an education desert. DeVos’s record is so extreme that her nomination has made some allies of the charter movement queasy, along with teachers’ unions and other public-school advocates. The Massachusetts Charter Public School Association wrote to Senator Warren this week to express the association’s “concern” with DeVos, on account of her recent efforts to kill legislation to provide more oversight over Michigan’s charters. More than 200 national groups comprising the -he Leadership Conference on Civil and Human Rights sent a separate letter opposing her confirmation because of her efforts to “undermine bedrock American principles of equal opportunity, nondiscrimination and public education itself.” Others, including Senator Warren, are just as concerned about DeVos’s lack of a record on critical issues overseen by the Department of Education—about where she stands on re-privatizing the federal student-loan program, for instance; access to pre-kindergarten; or punitive discipline. Republicans have rushed DeVos’s nomination along, and may make a complete evaluation impossible. The hearing was postponed after Democrats complained that an ethics review of DeVos’s conflicts of interest had not been completed (at the time of this writing, it still hasn’t been), and Senator Patty Murray, the ranking Democrat on the HELP committee, said Thursday that she still has “some concerns about missing information” on DeVos’s financial disclosure forms. Meanwhile, according to The New York Times, committee chairman Lamar Alexander has decided to limit fellow committee members’ questions to five minutes. In the end it’s likely that DeVos will be confirmed. 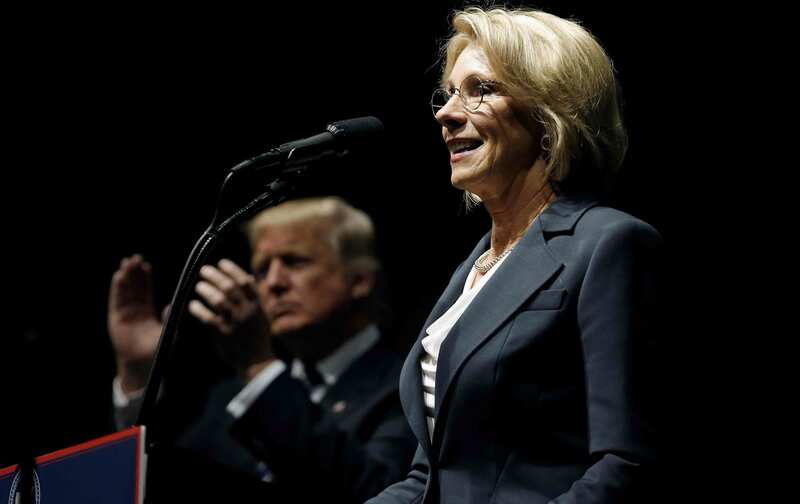 For public-school advocates, the only small, good thing to come of her nomination may be a more critical conversation about what has until now been a bipartisan project to privatize public education.